How could Mexico inflict the most damage on the United States? In normal times this question would not be top of mind for Mexican policy makers. Mexican governments over the last quarter-century have consistently pushed back against the nation’s historical resentment toward the United States, hoping to build a more cooperative relationship with its overbearing northern neighbor. It must convince Mr. Trump that if he blows up the trade agreement on which Mexico has staked its hopes of development, by weaving its economy ever more closely into that of the United States, the United States will suffer, too. The critical question is whether Mexico’s threat will be convincing. Mexico’s main challenge as it confronts a hostile Trump administration is the enormous asymmetry of the bilateral relationship. 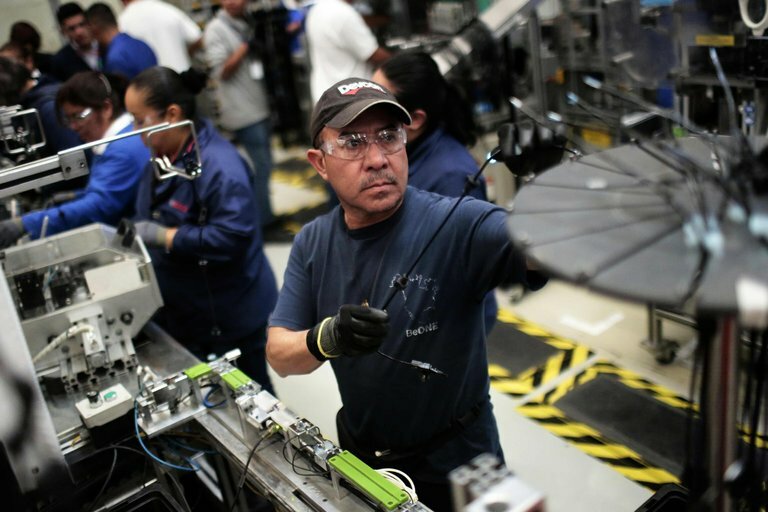 Ending Nafta would hurt the United States: Six million American jobs depend on exports to Mexico, according to Mexican officials. But to Mexico, it could prove devastating. Mexico has relied on the pact to draw foreign capital into the country, not only ensuring multinational companies stable access to the largest consumer market in the world but also guaranteeing that their investment is safe, noted Luis Rubio, who heads the Center of Research for Development in Mexico City. The makings of a Mexican strategy for defending its interests started coming into focus on Monday, when President Enrique Peña Nieto declared that negotiations for a future relationship with the United States would not be limited to trade. His hope is that by introducing broader uncertainty about the bilateral relationship — Will Mexico still cooperate in the fight against drug trafficking? Will it stop foreign terrorists from using Mexico as a way station into the United States? — Mexico can raise the stakes enough for Mr. Trump to reconsider his “America first” approach to commerce. “Mexico has a lot of chips to play,” said Jorge Castañeda, a former foreign secretary who has staked out a combative approach. Let Mr. Trump pull the United States out of Nafta, he argues. Instead of stopping Central American migrants at its southern border, Mexico should let them through on their way to the United States. “And let’s see if his wall keeps the terrorists out, because we won’t,” Mr. Castañeda added. The view that there is a potential silver lining to Mr. Trump’s hostility toward Nafta is also popular in some Washington circles. The quarter-century-old agreement is due for some modernization anyway, if only to deal with things like data protection, online crime and e-commerce — which were not around in the early 1990s. Nafta’s weak provisions on labor and environmental standards could also be improved. While trade has contributed to the growth of the American economy, the changing dynamics have also prompted concerns about lost jobs and the rising trade deficit. But when something is manufactured in the United States, the product is typically made up of parts and pieces from around the world. Many aspects of Nafta could be upgraded, trade experts say. It could do with new rules to open up government projects to bidders from all three Nafta partners. Allowing long-haul trucking companies from Mexico and the United States into each other’s markets could make trade between the two more efficient. What’s more, the Mexican-American border could benefit from more infrastructure investments to integrate energy networks, reduce clogged lines at border crossings and the like. 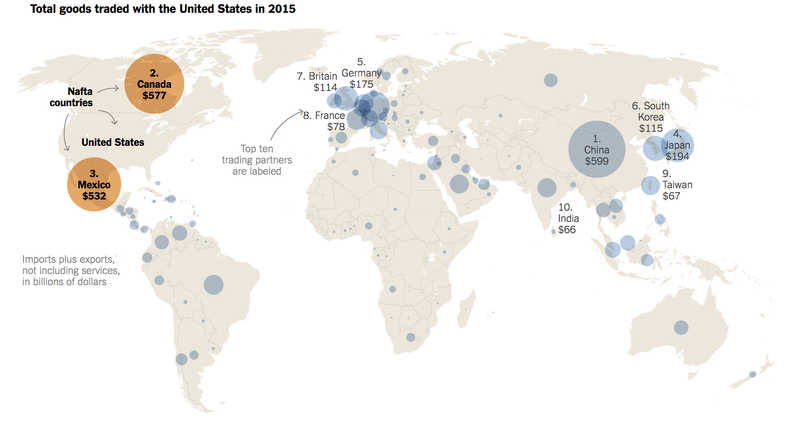 Now that Mr. Trump has formally nixed the Trans-Pacific Partnership, which would have tied North America and nine other nations from the Pacific Rim into one large trade bloc, some of its provisions could be drafted into a new North American deal. Gary Hufbauer of the pro-trade Peterson Institute for International Economics in Washington suggests that the name “Nafta” be retired — it has a bad reputation. But a lot of its substance could remain, perhaps in the form of separate bilateral agreements with Canada and Mexico. “Trump wants some easy victories,” Mr. Hufbauer pointed out. If he can score political points using his Twitter feed to persuade a few companies to keep jobs in the United States, why risk hurting the American economy by abandoning the North American trade deal? “Maybe that’s the reconciliation,” Mr. Hufbauer said. Still, it’s hard to reconcile the proposal for an improved, more effective trading pact in North America with Mr. Trump’s frequent portrayal of trade as a zero-sum game that inevitably shortchanges the United States. In Mr. Trump’s eyes, improving Nafta seems to mean eliminating Mexico’s trade surplus with the United States and limiting investment by American multinationals in Mexico. But one can’t quickly eliminate a $60 billion trade surplus with a new Nafta — not unless it has some incredibly draconian limits on imports or local content requirements that could be as damaging to Mexico as abandoning the pact altogether. Many Mexican officials fear that it is precisely this kind of draconian change that Mr. Trump has in mind. It would be politically profitable, at least in the short term. And it would signal toughness to China — a more formidable rival that is next on Mr. Trump’s list. If Canada stays out of the fray, cutting a separate deal with the United States to replace Nafta, Mexico would be left alone in an existential fight for its future. In this case, Mexico may have no choice but to raise the stakes and hope to arrive at the negotiating table with a threat at least as credible as Mr. Trump’s promise to pull out of the deal. If Mexico stands its ground and even allows Nafta to dissolve, it would send its own signal to China: Resistance is not futile. And Mr. Trump’s threat to raise tariffs against Mexico to 35 percent could easily be challenged under the rules of the World Trade Organization. This is, of course, a hugely risky strategy for Mexico. When Mr. Trump entered the presidential race in June 2015, a dollar was worth about 15 pesos. Now it’s worth about 22. A frontal confrontation with the United States might send it to 40, Mexican officials fear, fueling capital flight. And yet that may be Mexico’s strongest card. 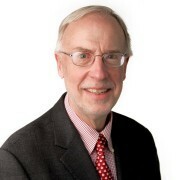 As noted by C. Fred Bergsten, director emeritus of the Peterson Institute, an irony of Mr. Trump’s approach to Mexico is that by weakening the peso so much, he is going to increase the bilateral trade deficit, increase Mexico’s competitiveness and make it more attractive for American companies to invest there. “That is going to swamp anything he achieves with his company-by-company efforts,” he added. SPIEGEL speaks to David Remnick, the editor of the New Yorker, about the dangers of fascism under Donald Trump, international leaders’ reactions to the election and the role of the press in reporting on the next administration. Pulitzer Prize-winner David Remnick, 58, has been the editor in chief of The New Yorker since 1998. He is also the author of a widely praised biography of Barack Obama and has privileged access to the current president. He conducted several interviews with Obama after the election. SPIEGEL: On the night of the election, you published a stunning warning that the election’s outcome was “surely the way fascism can begin.” It’s been three weeks now. Has fascism begun? Remnick: No it has not and I want to be clear about what I wrote. The whole sentence, the complete thought is this: I don’t think there will be fascism in America, but we have to do everything we can to fight against it. As the Germans know better than we do, disaster can take a nation by surprise, slowly, and then all at once. My deep sense of alarm has to do with his seeming lack of fealty to constitutionalism. He seems to think it is within his rights to trample the First Amendment, to disdain the press, to punish protesters or flag-burners, to ban ethnic categories of immigrants, and so on. He has myriad conflicts of interest. He appoints people of low quality, to say the least. He lies with astonishing frequency and in stunning volume. His temperament and character is precisely what you would hate to see in your children, much less your president. We can wish all these things will magically change once he is in office, but will they? I’ve lived through terrible presidents, we all have. I lived through the Nixon administration, which prolonged a horrific war for years and ran a criminal operation out of the White House, and I lived through the years with George W. Bush. And I lived for years in the Soviet Union and have seen the promise of democratic development turn, with Putin, into an authoritarian state. So yes, I think we should be alarmed, watchful, and, as journalists, rigorous and fearless. I think we should be alert. SPIEGEL: Similar developments have taken place in other countries as well. Remnick: Trump’s election is part of an international trend that’s no less alarming, in Britain, in France, in Germany, in Austria. Vladimir Putin wanted to see this outcome no less than he would like to see nationalists and anti-Europeanists win in France. He wants to become the de facto head of an illiberal, xenophobic, hypernationalist trend in world politics. He wants practical things, like the end of economic sanctions, but he also wants far greater sway in Europe and in the overall ideological trends of the world. So Trump’s rise is troubling not just on an American level but on an international level. SPIEGEL: Donald Trump sends mixed messages. He claims to want to unite the country but he appointed a person like Steve Bannon, a white supremacist, as his chief strategist. What does all this mean in terms of the direction the Trump administration might take? Remnick: There are inconsistencies in his ideology. It’s worth remembering that this is very different than the Reagan experience. Ronald Reagan came to office and had already been an experienced politician as governor of California, whose ideology and ideas, no matter how simplistic or no matter how much you may disagree with them, were fairly well-developed and fairly consistent. 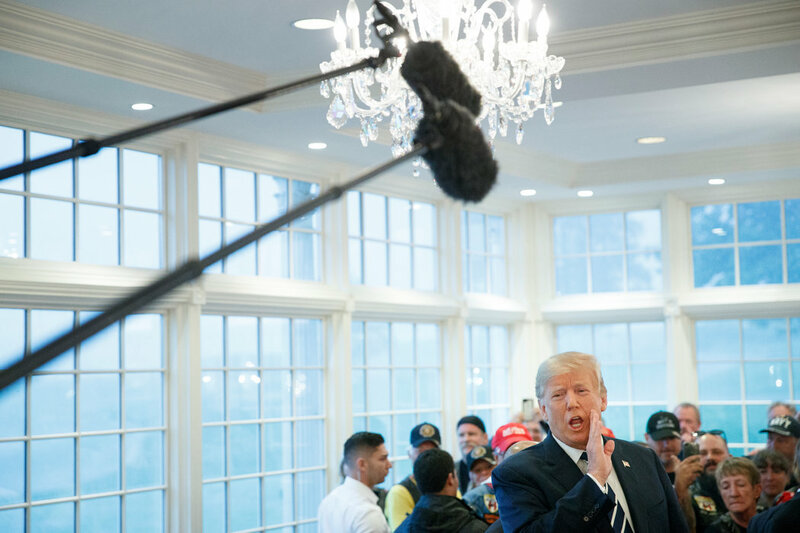 Donald Trump is a real-estate branding operator and a reality-show television star whose entrance into big-time politics, as a victor, as someone who will now wield tremendous power, was as shocking to him as it was to everybody else. I think that he got into the race thinking that it would be good for his brand, that he would surprise some people by doing better than expected, and then lose, and then come out of it with a certain amount of embellishment of his celebrity and, therefore, his business. He expected to gain, both financially and in prestige, by losing. But now he has won. Suddenly, he finds himself president of the United States. Suddenly, he’s not only wrestling with whatever competing ideas exist in his head, but also with the shock of the responsibility itself. Again, we can hope that the responsibilities and realities will weigh on him and he will not be the president we fear, but rather something more stable. SPIEGEL: Trump put the economy at the center of his campaign and promised to bring jobs back to the United States. What’s wrong with that? Remnick: There’s nothing wrong with creating jobs. What’s wrong is to seed the illusion that you will magically bring back the economy of 1970, that you will reopen coal mines. The notion that somehow through a trade war or protectionism or magical thinking that we’re going to return to a romanticized economic past is, in the end, going to be an illusion. And a severe disappointment to millions of decent, hard-working people. Remnick: … and maybe Santa Claus is real. Here’s the problem: reality. I would love to have a stable, productive relationship with Russia. I would also like to see Russia not interfere in our elections. I would like to see Russia not invade Ukraine or put pressure on and threaten Baltic states. But we live in the real and existing world. And now, despite the long election campaign, Donald Trump is going to have to live in the real world in which Vladimir Putin is exactly who he presents himself to be, and Putin is extremely skilled. He’s not going to make it very easy for the United States or Germany. And he’s going to test Trump. SPIEGEL: Who knows how they will handle each other. Maybe Putin will find his match in Donald Trump. Remnick: I don’t know that Donald Trump is anything more to Putin than what Lenin called a poleznye durak, a useful idiot. I want to make something clear. By the laws of the United States, Trump won the election. And unless some sensational story is discovered about manipulation or vote counts, we’re going to have to live with that. And I know, too, that millions and millions of people voted for Trump not because they are cartoon racists, but because they did not like Hillary Clinton for a variety of reasons, because they had real economic and social grievances. I think the hacking of the DNC, the FBI’s behavior, and, above all, the idea of Russian interference, are outrageous, but there is the law. And I think the Electoral College is an absurd 18th-century construct. But that is the law. Yet I say all these critical things not out of a sense of anti-patriotism but out of a sense of patriotism, out of a sense of alarmed and informed concern for my country. SPIEGEL: It’s remarkable how many people suddenly made their peace with Trump following the election. Why is that? Remnick: A lot of it is opportunism as well as reflex and resignation. SPIEGEL: Even President Obama offered him more assistance and advice than usual. Why is he doing that? 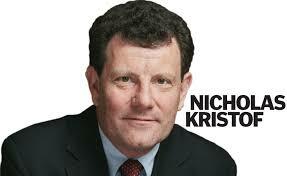 Remnick: I don’t think President Obama gave him more advice and assistance than usual. He gave him precisely the amount of advice and assistance that is required for the peaceful transition of power in the United States. His hope, at least until January 20th, is that he can impress upon Trump the gravity of his position, convince him that things are not so simplistic or not simplistic at all. Obama called him “uniquely unqualified” and “temperamentally unfit,” and you can be sure he thinks that today, just as he thought it before November 8th. I know from my conversations with people in the administration that every world leader that Obama met in Berlin, in Peru, in Athens was extremely alarmed by Trump’s election. That very much includes Angela Merkel. SPIEGEL: Let’s talk about the mistakes on the left. We learned from the hacked emails that the DNC supported Hillary Clinton at a very early stage and wanted her to be the party’s nominee. Was it wrong to get behind Clinton so wholeheartedly? Remnick: Do I think that everybody on the Clinton side had a proper understanding of the resentments aimed at them? No, I don’t. Do I think they made mistakes in places where they could have campaigned and they didn’t campaign enough? Yes, I do. Michigan, Wisconsin. Pennsylvania. Hindsight is always 20/20. SPIEGEL: But again: Was Clinton the wrong candidate? Remnick: In hindsight. The person that most obviously had strengths where she had weaknesses was Joe Biden. SPIEGEL: The Clintons made it clear to him at an early stage that he should stay out of her way. Remnick: Joe Biden had a relationship with places like Pennsylvania and Michigan and Ohio and the white working class that Hillary Clinton didn’t. The one thing I’m quite critical of her for, and it obviously hurt her, is that at some level, the Clintons had to know that she was going to run for president. Why did they feel it necessary to make tens of millions of dollars with speaking engagements? They must have known that it would look grotesque. The word for it is “buckraking.” It’s beyond me. I don’t understand it. SPIEGEL: Maybe they are so entangled in their own world of private email servers and million-dollar incomes. Maybe they live in a different universe. Remnick: The private email server was a mistake, a serious mistake, and she should have apologized for it months earlier, but she kept making lawyerly excuses. The buckraking seemed to me to have an ethical and moral dimension that was just inexcusable. SPIEGEL: There is currently a heated debate taking place on the left about how to integrate the various interests of different social groups under one tent. Was it a mistake to have relied on minorities in the electorate? Remnick: The Democratic vote consists of minorities and educated whites. And the minority vote is growing, which is part of the alarm of so many Republicans and why Trump constantly whipped up their alarm with his racist statements. But it’s also important to remember that a huge constituency, such as Hispanics, is not 100 percent Democratic. It’s more complex than that. SPIEGEL: But would you agree with people like Bernie Sanders who claim that the political left should focus more on the white working class? Remnick: To some degree, sure. There are real grievances there that must be addressed not just rhetorically but in policy. But you have to understand that a lot of the working class is not white too. SPIEGEL: But many people’s job-losses and fears are real. Remnick: Of course. Although it is worth pointing out that unemployment was heading toward catastrophic levels in 2009 and is now under 5 percent. The question for so many is the quality of work, the future of work under globalism and de-industrialization. A typical example is a person who had a good factory job making 80,000 dollars, with health insurance, who was able to send his kids possibly to college and then he or she suddenly loses that job because the factory closed down. And now that same person is bagging groceries at Walmart and making $35,000. 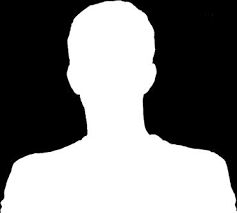 That person has lost a huge amount of income and a sense of pride, and, unfortunately, with a demagogue like Trump, there is the danger that this same person will be encouraged to believe that he or she lost their job and status because all the goodies are being given by politicians to darker people, to undocumented immigrants. And resentments bloom. It’s a classic case of pitting one group against another for political gain. You are losing because of Jewish bankers. You are losing because blacks are getting their civil rights in the cities. You are losing out because Mexican rapists are taking your job. There are two forms of populism, left-wing populism and right-wing populism. Right-wing populism requires the denigration of an “Other.” Left-wing populism tends to be about the haves and have-nots. SPIEGEL: There was one person during the campaign who seemed to outshine the others: Michelle Obama. Will we see her on the national stage at one point, maybe to challenge Trump? Remnick: I doubt it very seriously. I’ve never encountered someone in public life who has less desire to hold office than Michelle Obama, though she is incredibly gifted at retail politics. 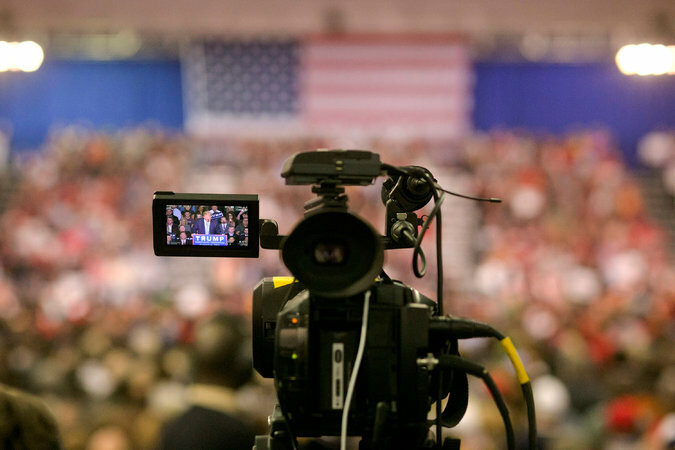 SPIEGEL: This election presented an unprecedented challenge to journalists. Trump himself concocted hundreds of lies without consequences and false news spread like a virus, almost always in Trump’s favor. SPIEGEL: What are the implications for democracy? Remnick: It corrodes public discourse, it undermines our collective knowledge of reality. It makes democracy more complicated. I don’t want to romanticize the world in which everybody watched three networks and the Washington Post and the New York Times and the Wall Street Journal were incredibly dominant. That time has passed. And the internet is very democratizing in some ways, but it also has other effects. So that on Facebook, a lie can seem as convincing to some as an article from SPIEGEL or the Washington Post. That’s a problem. I can then like it and like it again and start creating my own media universe, both for me and for my friends, and so we become more and more fenced off from one another. We begin to inhabit oppositional and rarely intersecting mental universes having to do with ideology and fact and non-fact and news and non-news. We’ve seen these tendencies before in previous elections, but now it’s just incredibly powerful. SPIEGEL: What are the lessons for the media? Remnick: It means we have to do our jobs better, more tirelessly and stop whining about it. As journalists, we need to find every avenue to distribute our work, and try to be so good that we become increasingly more influential than before. We should put pressure on power and write the truth and write relentlessly and fearlessly. That’s the job. SPIEGEL: As a result of the efforts of Jill Stein, the Green Party candidate, a recount is taking place in Wisconsin, maybe also in Michigan and Pennsylvania. In response, Trump claimed that the election had been fraudulent. What does it say about the status of American democracy that the outcome is being questioned by people in both parties? Remnick: I live in a country where, at least by my sense of arithmetic and justice, Al Gore should have been president, not George W. Bush. To this day, John Kerry probably thinks he won Ohio in 2004 because he had suspicions about the vote in Ohio. And, by the way, Richard Nixon had suspicions in 1960 about the vote in Chicago when he lost to JFK. Democratic institutions, even in the oldest operating democracy in the world, are anything but perfect. SPIEGEL: So even if there are irregularities, the outcome won’t change? Remnick: I just don’t know. Prediction is a low form of journalism. SPIEGEL: Looking forward four years from now, are you sure that we won’t look back and say, well, maybe Trump was indeed a second Reagan? Remnick: It’s not as if I wish that he becomes a catastrophically terrible president. I want to hope for the best. But I am an adult; deliberately naïve, dewy-eyed optimism is not the proper posture for a responsible adult, is it? As a citizen and as a journalist, it’s my job to exert as much pressure on power to help that not become the case. SPIEGEL: Mr. Remnick, we thank you for this interview. 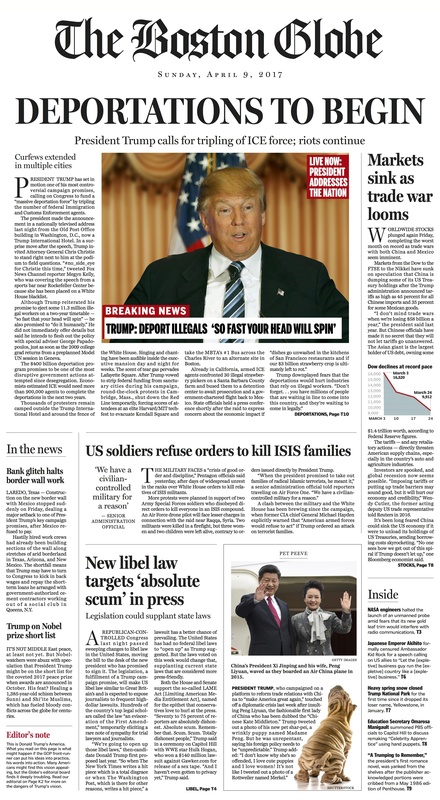 El domingo 10 de abril, el periódico THE BOSTON GLOBE imprimió una portada que, según su Editorial Board, “esperamos que nunca tendremos que publicar”. 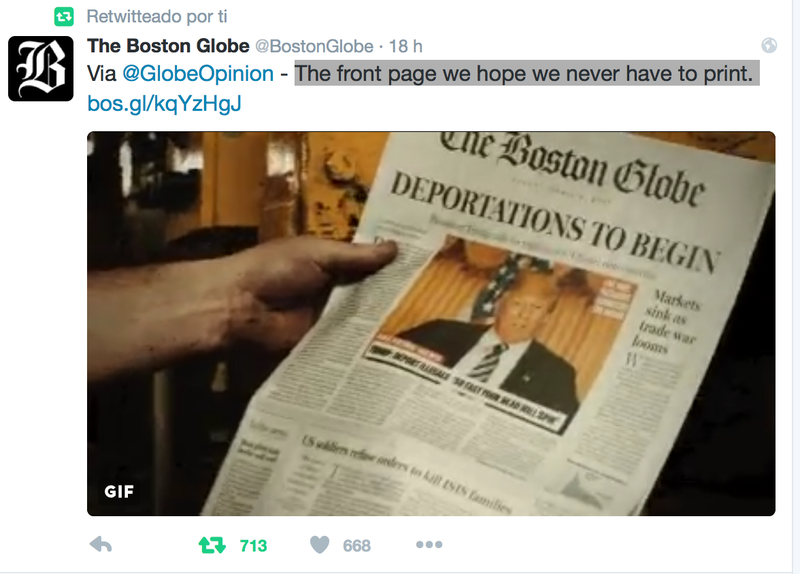 Al interior de la edición el Globe publica el editorial que abajo reproducimos. Ryan’s speech was aimed at pulling the Republican Party away from Donald Trump’s embrace — though he never actually mentioned Trump by name. Events quickly showed what he is up against. The speaker was quickly drowned out by a snarling argument between Trump and Sen. Ted Cruz of Texas over their wives that almost eclipsed the terrorist attacks in Brussels in the U.S. media. By week’s end, the Republican race had gone into the gutter over tabloid charges of infidelity, which the senator vehemently denied and for which he blamed the New York billionaire, who called it unfounded. A race that seemed already at the bottom managed to find another low. The front-runner for the nomination of the Republican Party is as much a reflection of the condition as a cause, a reality that Ryan (R-Wis.) touched on only lightly in calling for a more positive and uplifting approach to politics by all sides. Which means stopping Trump alone won’t necessarily solve all of the party’s problems. The authors took aim at the gridlocked and dysfunctional politics of Washington and the broader issue of political polarization that has become endemic in recent years. They were unsparing but not even-handed in their critique. They were ahead of others in describing the underlying causes of polarization as asymmetrical, with the Republican Party — in particular its most hard-line faction — as deserving of far more of the blame for the breakdown in governing. What played out primarily in the party’s congressional wing has come to consume the presidential nominating contest. In their own ways, Trump and Cruz have brought to the surface the economic and cultural anger among many of those in the party’s base as well as the distrust of the party leadership — the same motivating forces behind the Freedom Caucus rebels in the House Republican conference. Ohio Gov. John Kasich, the third remaining candidate for the nomination, is a dissenting voice, calling for cooperation and compromise. At this point, he is not just a dissenting voice; he is a minority voice in the presidential competition, unless he can start winning more primaries. Trump and Ryan represent bookends in a political debate that has considerable consequences for the Republican Party and for the country. 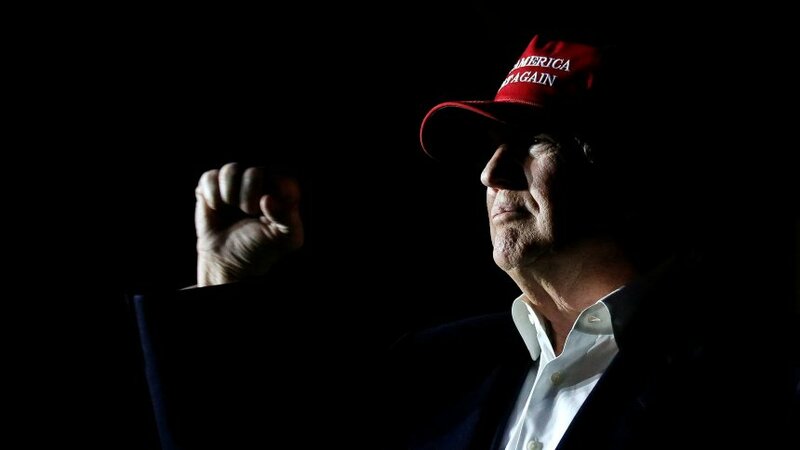 Trump’s position as front-runner not only highlights the degree to which the party is being taken over by anti-establishment forces but also foreshadows the possibility of a significant defeat in November if, as the GOP nominee, Trump is unable to reverse his standing among women, Hispanics, African Americans and other voting groups.